Moraira is situated south of Javea, on the Costa Blanca and offers many of the same features that make Javea so popular with overseas property buyers. Sheltered from winds by the surrounding mountain ranges, and with many Villas for sale in Moraira situated on the hillside, with views out to the Mediterranean sea, you will really be able to appreciate the Spanish climate, and Mediterranean way of life. Villas for sale Moraira are currently very popular with investors, wishing to purchase properties and rent them to the influx of tourists in the summer months. Because of Moraira’s small size, building space is limited and this attributes to making Villas for sale Moraira exclusive, and a sure hit for the long term investment. Moraira has a number of villas for sale which are in good order, with swimming pools and exotic gardens, while maintaining that authentic Spanish feel of a small fishing village. Newer villas are also available in the area, offering modern living conveniences. There are also several development projects around Moraira where new properties can be purchased ahead of time, often with a discount on the estimated completed sale price, if you are willing to wait for the building work to be completed. Villas for sale Moraira are also popular because of the facilities that Moraira is able to offer, there are many restaurants including some of the highest awarded restaurants in Spain. Although Moraira is a small fishing town, a new harbour has been constructed allowing for year round boat mooring, there is also great conditions for water sports enthusiasts, with some sheltered coves offering perfect steady winds for wind surfers. Golfers looking for Villas for sale Moraira will be rewarded with some excellent local courses to play, including Moraira’s own golf course, and the courses of Javea and Denia to the north to name but a few. We feature hundreds of villas for sale in Moraira, updated daily through our network of trusted estate agents working in the Moraira area. 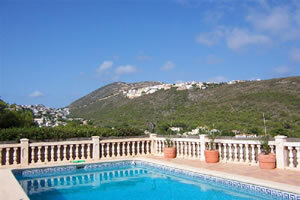 Having lived in the area for over 12 years, we know how to make your search for villas for sale Moraira a pleasant one. Given your requirements for Villas for sale in Moraira we can find some suitable matches, and arrange viewings with local estate agents, acting as your independent property advisor. To arrange Villas for sale Moraira viewings, please do not hesitate to contact us, or view Villas for sale in Moraira now.